www.simplyasep.com All people in Indonesia are very happy these days because of two biggest events almost happens at the same time. Do you have any idea what are they? First Asian Games 2018 Jakarta Palembang and Happy Seventeen of August, commemoratingof 73th anniversary of Independence day. The happiness in Indonesia now is not totally enjoyed by the people of the republic to Indonesia due to at the same time big disaster of the earthquake struck Lombok, a part of the most amazing islands in Indonesia. Hundreds of people died and injured thousands of people. We all in deepest condolences and we have to go through this difficult situations. Indonesia is proud to be a host of this coming the 2018 Asian Games which officially known as the 18th Asian Games and also known as Jakarta Palembang 2018. 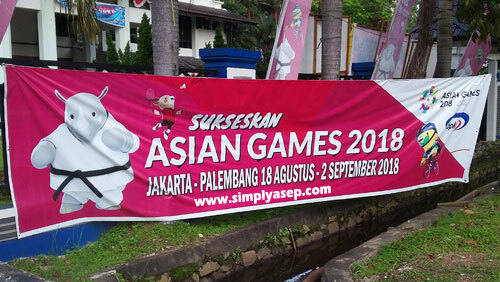 The Asian Games 2018 is a pan-Asian multi-sport event scheduled to be held from 18 August to 2 September 2018 in the Indonesian cities of Jakarta and Palembang. The Asian Games are being co-hosted in two cities; the Indonesian capital of Jakarta (which is hosting the Games for the first time since 1962), and Palembang, the capital of the South Sumatra province. According to the official site of the 2018 Asian Games, most of the events will be held in and around those two cities, including venues in Bandung and province of West Java and Banten. The opening and closing ceremonies of the Games will be held at Gelora Bung Karno Main Stadium in Jakarta. Traditions also include eating Indonesian crackers (known as 'krupuk') or fruit hanging on a string and climbing a pinang tree to reach for a prize. National Flag of Indonesia. The national flag of Indonesia is called 'Sang Saka Merah-Putih' (the sacred red and white) and was unveiled on August 17, 1945. The design is derived from the banner of Majapahit Empire in East Java which ruled in the region before the arrival of the Dutch.